What Are The Rules to Dealers Choice Poker? - Casino Answers! Casino Answers » Poker » Dealers Choice » What Are The Rules to Dealers Choice Poker? Dealer’s Choice is a game most commonly known at home games, however it has made it’s way to the wonderful world of online poker. The rules of Dealer’s Choice are simple: whoever has the dealer’s button gets to choose what game you will be playing! The selection of games includes Texas Hold’Em, Razz and Omaha. You choose which games you will be playing before the deal and then you play that game, simple and fun. When you play dealer’s choice in a home game, the rules are rather simple: the dealer makes the rules. These can be any kind of game from the dealer picking to play a game of Texas Hold’em or a more loose and fun game like Crazy Pineapple Poker. A lot of playerss also like to introduce wild cards into the equation. “Deuces wild” would obviously mean twos are wild. While “One eyed faces” would imply that this would include the jack of spades, jack of hearts (known as”one-eyed jacks”) and the king of diamonds. These games can get pretty crazy as players might end up with four or even five of a kind. Your simple flush or three of a kind might not play in a game like this so be careful out there. A very fun, but slightly complicated game of poker is “seven and what makes it”. This is a game where sevens are wild, but also any two cards that combine to make seven are also wild. So if you had a 3 and a 4, they would both be wild because they add up to seven. A hand like 7-3-4-A-A would be the best hand as it would count as five Aces. Dealer’s Choice is unfortunately not currently being offering at online poker rooms. If you are interested in playing a game similar to Dealer’s Choice, you should check out HORSE. It is a combination of Hold’Em, Omaha, Razz, Seven Card Stud and Eight-Or-Better (seven card stud high-low). The game rotates between these five games after each round or after a set amount of time. It is a really fun game to play and really tests your skills as an all around poker player. Just like dealer’s choice poker. Where can I play Dealer’s Choice online? 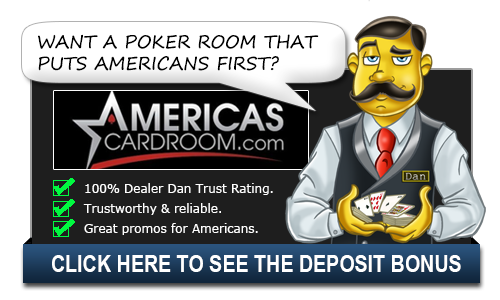 Currently, Dealer’s Choice is not being offered by any of the online poker sites. We will make sure to update this article if this changes. What is the poker game Dealer’s Choice? Dealer’s Choice is gives the dealer the choice between one of three poker games – Texas Hold’em, Razz and Omaha.